Samurai Champloo was created by much of the same talent that made 'everyone's favorite anime' Cowboy Bebop, including director Shinichirō Watanabe. The series has aired in numerous countries across the globe, spawned several successful soundtracks, and recently has been re-released in its entirety as a DVD box set - which I got my hands on to review. What I'm getting at here is that if you haven't seen it, or at least heard its praise, you've likely been locked-up for the past 5 years or just discovered anime (and television) yesterday. 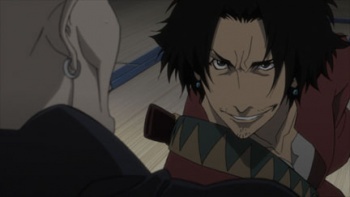 If by some chance you've managed to avoid it until this point, it's time that you and Champloo get acquainted. The opening theme sets the tone for the series: Samurai Champloo is an anachronism-infused period piece that takes place in Japan's Edo era. Blending elements of samurai and modern action with comedy ranging from slapstick to complete irreverence, Champloo is topped off with elements from old school hip-hop and other countercultures. Anime is no stranger to hip-hop, but never has it been integrated as brilliantly as it is in Champloo[/I]. From the show's aesthetics, to the soundtrack fueled by rap beats, Mugen's break-dance inspired fighting style, episode themes , and subtle designs on the back of kimonos, the urban influence can be felt everywhere. Anachronisms of other varieties are also prevalent; Jin's fashionable sunglasses, anarchist-punk styled thugs, an inconspicuous eyebrow piercing; the list goes on. These out-of-place elements in combination with actual historic fact create for a rich setting, the likes of which is rarely seen. The series has such an exuberant amount of personality and artistic flair that it takes on a life of its own. This is the heart and soul of Champloo; if it were somehow extinguished the show would remain solid, but would also be entirely forgettable. The premise is as basic as can be. It follows a young girl accompanied by two swordsmen she recruited on a quest to go from point A to point B, and all the zany adventures which occur in between. From the very first episode the viewer knows where the series is going with a pretty decent sense of how it's going to end, and unfortunately, Champloo pulls no surprises. The pacing is very similar to that of Cowboy Bebop. Most episodes stand up fine on their own while maintaining a connection with the overarching story. However, this method of storytelling seems significantly more effective in Bebop for two reasons: We're not quite sure where Bebop is going and the final payoff is indescribably better (more on this later). Some episodes do prove fairly memorable, though the majority are unremarkable - that's not to say they aren't entertaining, they just don't stick with you. Mugen and Jin are incredibly standard character archetypes: the unrefined, short-tempered vagabond and the well-mannered, always calm samurai. This is quite easily overlooked as the molds they fill play well into the trio's interaction with one another. Both male leads have a fair amount of depth, but it can be tricky to spot, especially with Mugen. It becomes obvious that Fuu is the glue that holds everything together, and she is also the most developed character of the three, and the only one to display significant growth throughout the journey. Her traveling companions remain largely unchanged, but this somehow works. Sadly, she is often too easily overlooked in lieu of Mugen's badassery. Supporting characters in Champloo are entirely forgettable: a large malformed man shunned by villagers as a monster, a blind assassin, a beautiful ninja, the dutiful yakuza boss; none of these characters stand out. The elegant, androgynous samurai appears to be the only typical Edo period character missing here - Jin almost fits the bill, almost. The show isn't terribly hindered by an uninspired supporting cast, though it is a bit disappointing when one considers what could have been. On the note of what could have been ... given the bang that Cowboy Bebop ends with, I expected nothing less from Champloo. However, what we were actually presented with was horrifically underwhelming. Despite existing before the story even began for the viewer, the build-up for the final batch of antagonists was nonexistent; they felt entirely irrelevant. In the interests of not spoiling anything for the three people who have yet to see this series, it is pretty open ended. The rudimentary plot, the issues with pacing, the vanilla supporting characters, everything could have been justified here - and it wasn't. Instead it was left open. Bottom-line: It's no Cowboy Bebop, but what is? Despite a linear plot, pacing that doesn't build anticipation or tension, and a throw away supporting cast, Samurai Champloo is still one of the best anime series of the decade thanks to its amazing anachronistic setting, top-notch production values, and personality to spare. Recommendation: Yes. Watch this. If you've already seen it, watch it again, there's something you missed. If you don't like action and/or samurais the comedic interaction with the trio and stylish presentation is still enough reason to give it a go. Salvan Bonaminio also wants to cop a feel on Momo.